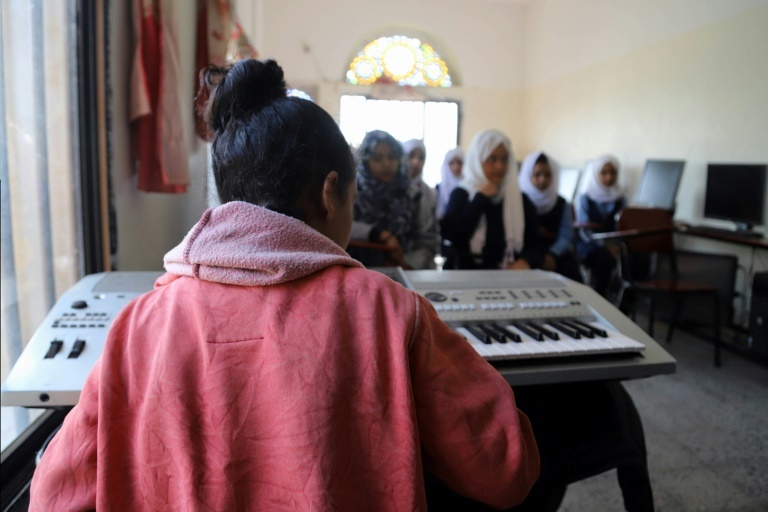 The sound of music fills the halls at a school in the Yemeni city of Taez, where little Nazira al-Jaafari sits at a keyboard as a teacher takes her through the notes. “I love music,” said Jaafari, a pupil at the Al-Nawras school where tutors are trying to help students temporarily forget the ongoing war. Today, the city is home to some of the most intense fighting in a war between Yemen’s Iran-backed Huthi rebels and rival government forces allied with a regional military coalition led by powerhouse Saudi Arabia. The United Nations has urged both parties to open humanitarian corridors to besieged Taez, where state troops are embedded inside city limits — surrounded by rebel forces. The three-storey Al-Nawras school was hit in 2015-2016, right after Saudi Arabia and its allies joined the government’s fight against the Huthis. When it reopened its doors, walls still pockmarked with bullet holes, educators decided to expand the music programme, making it part of the core curriculum alongside maths and Arabic, with the hope that it would restore joy to their students’ days. “The psychological state of the students was very difficult when we reopened here, after all the shelling and bombing and fighting,” said principal Shehabeddine al-Sharabi. The head of a university in neighboring Mokha recommended music, loaning instruments to Al-Nawras free of charge. “Music is not an extra-curricular activity here. We can see how it impacts our students, how they are more responsive through music. It yields purely positive revenue,” Sharabi said. And in the humble classrooms of Al-Nawras, dozens of boys and girls find daily, albeit temporary, reprieve from atrocities in a country the UN says is home to the world’s worst humanitarian crisis. Smiling and tapping on their desks, a class of bright-eyed students sing, in English, “My face, my face, this is my nose”. In a class later in the day, slightly older children sing “Education is a weapon”. In Taez, teacher Abir al-Sharabi takes the time to help students — like Jaafari — learn to play the tunes themselves. “There’s a sense that students feel more comfortable here than in their other classes,” Sharabi told AFP. “Their energy in this class is different. “And some students even have experience in singing! All their voices are beautiful. Singing helps the psyche,” she told AFP.